CMA Songwriters Event (Indigo O2, London; Friday March 14, 2014) Bob DiPiero, Brett James, Striking Matches and Martina McBride. Also attending the event backstage: Sarah Trahern (CMA CEO), Damon Whiteside (CMA Senior VP) and Scott Borchetta (President & CEO of Big Machine Records). CMA Songwriters Series an evening with the storytellers behind the hits took place the evening before C2C 2014 on Friday, March 14 at The O2’s IndigO2. It was hosted by award-winning songwriter Bob DiPiero with an intimate evening of songs and the stories behind them featuring Martina McBride, Brett James, and the “tastemakers” hot new signed US duo Striking Matches. 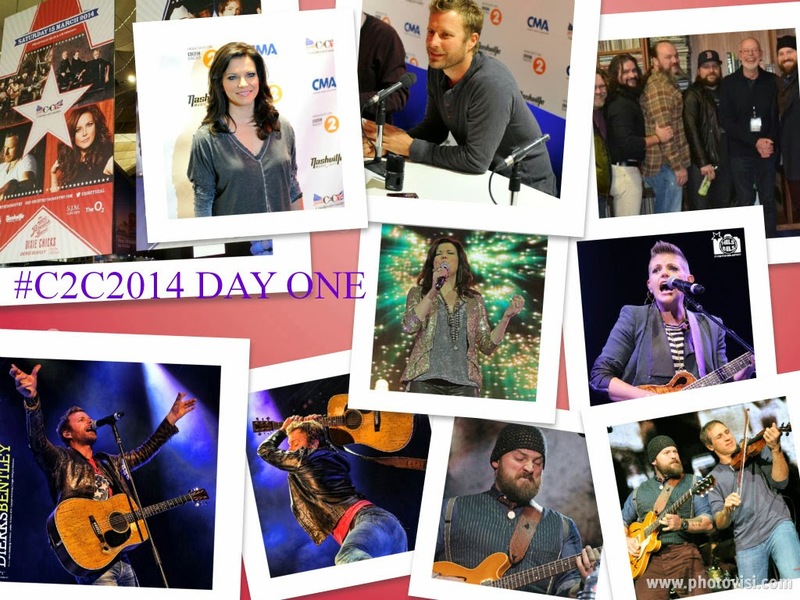 (Review) For The Country Record by Vickye Fisher (Writer & country music blogger extraordinaire) - How Striking Matches Stole The CMA Songwriters Series 2014...As part of the Country to Country festivities in London, England this past weekend, the celebrations of country music kicked off with the CMA Songwriters series...But it was Striking Matches who really stood out to everyone in attendance. Many in the audience had not previously heard of them, as they have only just been signed, but afterwards they were the only ones being talked about, for their solid tracks, their effortless but fantastic guitar skills, and their incredibly strong connection as performers. Justin Davis and Sarah Zimmerman have only been playing together for 3 years, but in that time they have become so tightly rehearsed, their guitar duets complex and expertly composed, yet carried out with ease and always performed dynamically and with a smile. They were electric to watch; from Nashville favorites such as ‘When The Right Comes Along’ and ‘I Ain’t Leaving Without Your Love’ as well as their own singles ‘Trouble Is As Trouble Does’ and ‘Make A Liar Out of Me’, they had style and conviction and were just as vocally on form as they were instrumentally. Sarah even excelled on the mandolin and had crazy skills with a slide; all of this prompted constant praise from the other writers on stage, with even Bob DiPiero simply blown away by what he was witnessing. Following Martina McBride, who seemed to be having a little bit of an off night vocally (although still great, she struggled a little on the higher notes), they more than held their own but showed an endearing down-to-earth attitude that had them nervous to perform alongside the greats and blushing with praise. Overall it was a great night but had everyone sure that Striking Matches are going to break out, and break out big time. ”It’s Bob, The Guardian are asking us for a pic of Taylor and what WE would like them to print”! This was the second of its kind and biggest country festival in the UK. The joint venture between the O2 promoters, the Country Music Association in Nashville and BBC Radio 2. Country music A-listers aim was again to “bring a little piece of Nashville” to central London with fans heading two-steppin down to the Millennium Dome/ North Greenwich Arena, more known in this modern branding world as the London O2 Arena. 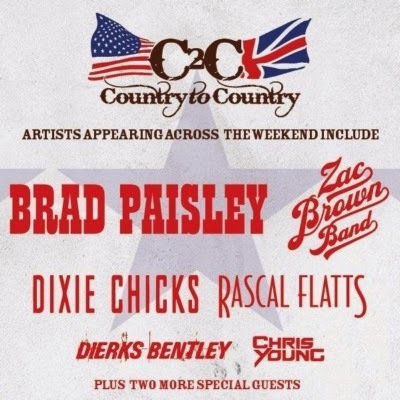 The C2C: Country To Country music festival took place over two days of 15th and 16th of March 2014 and was again compered by Radio 2’s 67-year old “Country King” Bob Harris (OBE). 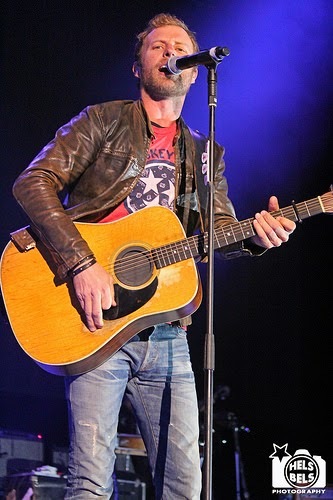 The key moment of the 2014 C2C Festival came at the end of Dierks Bentley's set on Saturday night when, overwhelmed by waves of enthusiasm at the sold-out O2 Arena, he announced: "When I get home I'm telling ALL my friends – Jason Aldean, Miranda Lambert – EVERYONE – that we have a new home for country music and it's right here in London." Well Nashville isn't going out of business any time soon. But throughout this two-day event you got a real sense that America's mainstream country superstars are on the verge of something big in the UK. Taylor Swift has already stepped over the barriers thanks to teen appeal and an astute understanding of the tabloid publicity game. The fact that she is a monumental talent also helps, but in this hyper-competitive section of the music industry that's merely the entry requirement. The annual Country to Country festival at the O2 is a formidable weapon for artists trying to break through on this side of the Atlantic. As several of them explained at pre-show press conferences, banding together with other acts lets them play a giant venue like the 20,000-capacity O2 and present their full-scale arena shows without losing money on the deal ("well, not losing TOO much money" added Dierks Bentley with a rueful grin). Behind that comment lies the bare fact that each of these artists could sell out O2-sized arenas from Florida to California every night of the week if they wished. So it takes a strategic commitment to developing a new market to bring their bands and crews and big labour-intensive shows across the Atlantic. But it seems to be working. This year 's C2C was a sell-out when last year's didn't quite make it. There were eight major acts over two days plus more than 30 hopefuls on pop-up stages outside the auditorium (hot tip for stardom: boy-girl duo Striking Matches) plus a themed marketplace selling, of course, cowboys hats, cowboy boots and everything else western. The Telegraph (Rating; 4 STARS) With performances from Brad Paisley, The Band Perry and The Dixie Chicks, Country 2 Country showcased country music at its best......Extract: Sunday brought a headline set from Brad Paisley, modern country music's most successful export. His best-loved songs were remoulded to suit the event: Chris Young (winner of Nashville Star, a country-music version of American Idol) joined in on the party track Outstanding in Our Field, while The Band Perry added a softer side to the haunting Whiskey Lullaby. Paisley's set was filled with humour, in keeping with his music, but he counterbalanced that side of his work with blistering guitar solos and a stripped-back acoustic performance, neatly avoiding getting too close to novelty-act territory. The result was a set that felt modern, with his instrumental cover of Van Halen's Hot for Teacher illustrated by a Star Wars-themed animation of the band. If the latter touch was an attempt to keep the audience interested, it wasn't necessary – they were already with him all the way. From the world premier of Johnny Cash's new music video I Used to Love Her a Lot to the eight contemporary headline acts, Country 2 Country embodied the spirit of country music. This was a community coming together to celebrate and showcase the very best of modern country, while showing their respect to itsorigins. In the words of Brad Paisley himself: "This is country music". Martina McBride tweeted @martinamcbride Can't wait to play the show tonight at the O2!!! Still no suitcase, but on it's way. Hopefully will make it here before showtime! The Mirror by Brian Hancill - Once a much bigger star than anyone else here, she opened the show as if she were still at the top of the bill. As when she hit her stride on stage it suddenly occurred to me that Rayna James, the lead character in the hit TV soap opera Nashville, MUST be based on Martina to some extent. Still going strong well in her 40s. Check. Mum of teenage daughters. Check. Major league songwriter. Check. Unflagging energy, natural warmth and a showstopping voice. Check, check, check. With strong-woman anthems like Independence Day she's also a living breathing role model for every one of today's female country singers. 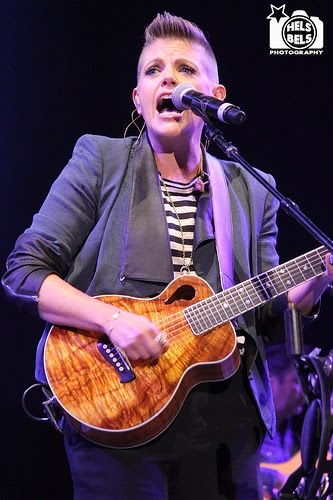 For The Country Record (Day One Review) Extract:... After soaking up the atmosphere around the O2 Arena, the main evening’s events began with Martina McBride. It was a bizarre reality that saw one of the last 20 years’ most successful entertainers playing to not even a half-full arena with a 45 minute set, and some of that showed in her performance. Opening with a rousing rendition of ‘Wild Angels’, she seemed to lack the enthusiasm that one would expect to see....I also noticed her vocals improve as time went on; with help from the crowd, she really rose to the occasion, and by the end was belting the songs out with gusto and emotion. Moshe - The show overall/ Disappointing to me. After a few wobbly vocal moments, Martina put in a pretty good opening set, getting the audience up with a populistic "This ones For The Girls"- a song I've always had affection for- & winding up with a powerful rendition of "Independence Day". An all too brief set. Steve Brewer - Great voice and a great start, but the sound needed to come down a notch or two. Kelly Hubbard - She was fantastic! The only thing that ruined it for me was everyone going in and out of the arena throughout the performance. Really distracting and quite rude! John Garret Frieslaar - Great start ... But too loud guys ..
Dierks Bentley tweeted @DierksBentley London! love the tweets and love y'all. can't wait to do it again. you think i was a little fired up last night?!?! The Mirror by Brian Hancill - Above everything else he seems like a really nice guy. He's Chris Martin without the punchability factor, Robbie Williams without the tattooed oafishness. His songs are what most people would call rock music but with country lyrics: meaning they tell a story and carry some meaning. Lots of meaning in the case of I Hold On, an exceptional number from his seventh album Riser, just out in the UK. He does a nice line in audience participation too. Spotting a girl in the crowd singing along to every word (and there were lots of those for every artist) he pulled her out of the crowd, draped his guitar round her neck and told her to carry on without him. While Dierks sat on the drum riser sipping a beer she made a decent fist of dancing with the band and, perhaps wisely, didn't attempt to sing. Ironically, the only slightly flat note came with a well-meaning attempt to create a unique moment – "a song we will only ever play this one time by one of the greatest English bands". Beatles? Stones? Nope, it was Wish You Were Here by Pink Floyd. Nothing wrong with that except such a downbeat lament of loss and regret really didn't fit the mood. We were only a few miles from the Dartford delta and if you ask me he should have done Mick 'n' Keef's Wild Flowers. But overall, Dierks (it's pronounced Dirks, by the way) was a revelation. We are now fans. For The Country Record (Day One Review) Extract:... Clearly really excited about being able to play to 15,000 fans in the UK, his performance was full of energy while he constantly stopped to try and take it all in. Focusing on the fun, upbeat party songs of his back catalogue as opposed to some of the moodier tracks on his latest album, he was riding high....A ball of excitement and full of enthusiasm, he was certainly a highlight of the weekend. Mandy Nowosad - You are total eye candy!!! Hayley Taylor - Fan-tas-tic!!!!!! Loved every second. Such amazing stage presence! Danielle Diamond - Hopefully people in the floor section get up an start dancing soon because it seems rude and I'm about to be an obnoxious American and start it up! m1lrr (Edinburgh) - He was superb live, especially liked his rendition of Hey Brother. Kev - What happened to the Dierks Bentley I used to listen to? 20 minutes was enough for me! The Mirror by Brian Hancill (I went with my 20-something daughter Melanie (a Dixie Chicks fan since her teens) ...There's currently an air of mystery around this trio. They were the only act not to hold a press conference and they seem to have said nothing in public to explain their unexpected reunion after a seven-year gap. 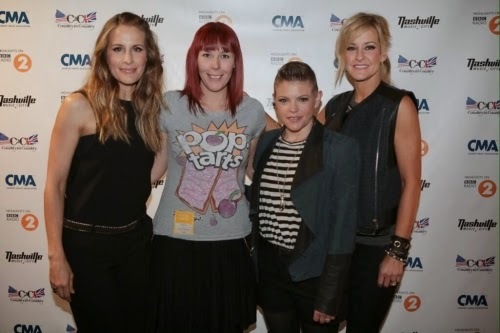 Last year lead singer Natalie Maines made a decent solo album and said she couldn't foresee a Chicks reunion anytime soon and maybe never. Sisters Emily Robison and Martie Maguire, meanwhile, were two albums into their new guise as the Court Yard Hounds.... There is no suggestion that they will record new material (their last album was Taking The Long Way in 2006) and with rumours of a US tour about to be announced, could it all be about the money? This unworthy thought was not entirely dispelled by the show. Everything seemed a little stiff for a few numbers until the sheer instrumental of exuberance of Sin Wagon loosened things up. After that they were musically brilliant as always, though we were disappointed that their career-spanning setlist didn't include Top Of The World or Travelling Soldier. And Natalie's bizarre rockabilly flat-top haircut with shaved sides looks, frankly, terrible. Sorry, we both agreed and it has to be said. Karen & Grace @KK14REN - And that's how it's done!!! @dixiechicks just nailed it!! absolutely amazing! Moshe - A weak start for the Dixie Chicks, I thought, but overall a pretty good set that was well received. Their personal statement single "Not Ready To Make Nice" got a very enthusiastic reception. It seems the OTT treatment meted out to them in the States after Martie's "Bush" comments still rankle with many fans. I thought Martie's voice sounded rather strained at times, but I was quite happy with their set. Carly Rodman Dicks - Booked because of the chicks, been a fan for 15 years and like someone else said could have cried before they came on just at the thought of seeing them! Where was their chat and banter with us? Their music was till good old DXC though. Chris Harris - There were a lot of very pissed up people on the floor. Even saw a "cat fight" at one point with 2 girls yanking each others hair! during Dixie Chicks. Stuart Mcniff - Natalie Maines vocals during the Dixie Chicks on Saturday night was dreadful. Suzanne Palmer - I loved the entire weekend. I have to say though that I was (and still am!!!) devastated that the Dixie Chicks didn't sing Travelin Soldier!! I was so excited to see them I could have cried on Saturday morning, but they left me a little cold. I didn't want to hear wrecking ball or bob dylan I wanted to hear their songs. Sorry if that is not what people want to hear but I was disappointed! The Mirror by Brian Hancill ..We may have been in a minority of only two but Saturday night's headliners left us completely cold. To start with, putting them on last after the Dixie Chicks might make sense in Nashville – they have scored 10 country No.1 singles – but it was nonsense in Britain, where the Chicks have a much higher profile. Their music had entirely passed me by so I checked them out on Spotify before the show and heard a lot of good-time country-lite with a bit of reggae ultra-lite thrown in. People are always better on stage so I tried not to write them off in advance. But it was no use. The three numbers we sat through reminded me variously of the Charlie Daniels Band, Jimmy Buffet and, most of all, Mumford and Sons – all major negatives in my book. Food and drink were a much more appealing prospect than listening to any more. So we tiptoed out and left poor Zac with only 19,998 souls to cheer him on. m1lrr (Edinburgh) - I loved, until the awful skeleton thing at the end. Bob Harris (BBC Radio 2) tweeted @WhisperingBob ...and not forgetting the amazing set from @zacbrownband @BHarrisCountry @BBCRadio2 Thursday at 7 pm. 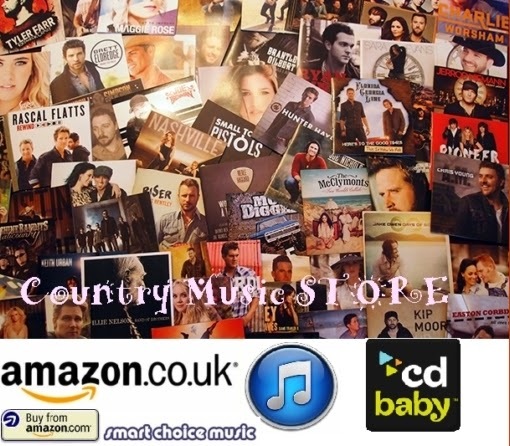 musicians, great performance, fine songs- & definably country. 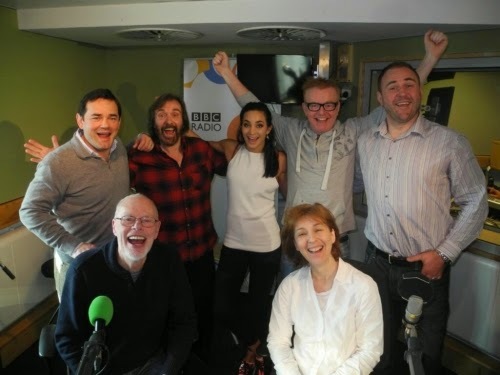 Then it all got a bit weird. Zac & the boys got into heavy rock territory with long, self indulgent solos & no traces of country. I stuck it out for another twenty minutes or so, hoping a return to the country ZBB, but by then I'd had enough & joined the exodus of fans leaving early. And their set had started so brilliantly! Peter - The audience seemed happy to hear their faithful rendition of Metallica's Enter Sandman. I was not. Also the ten minute jam was trying to say the least. They were my low point. Tony Lewis - You're lucky if you've just got sound problems with one artist. Last night there was poor sound for all four talented artists/bands. They deserved better. Steven Wilshaw - I have to mention ZBB, mega talented, but it wasn't a ROCK CONCERT, pretty indulgent I thought. They criticised Luke Bryan for being pop, then they turn into some heavy rockers....? Martina were OK, Dierks was awful (I left during "5150" - Photo ), Dixie Chicks as dull as I expected them to be, Zac Brown were self indulgent. I think that's it for me with the C2C - horrible venue, horrible seating, too loud, awful people (why must people fiddle with their f*cking phones ALL the time people are on stage?). Worse country music event I've ever been to! got the impression that [some people] had no idea who the acts were, it just seemed to be a random evening out for them. Funniest thing was when Bob Harris first appeared - I heard the woman next to me say to her friend, "Who's that?" Moshe (Readers letter and country magazine contributor, prolific forum poster) - I don't know if it was the worst gig I've been to - but certainly a disappointment to me. I didn't recognize the Metalica thing Zac Brown Band went into, but I didn't like it whatever it was, & got peed off. Sad thing is, I loved the first half of their set & already rated it as the highlight. Comparing to the Sunday show I attended at C2C last year, last year was 100% better. This year, not many highlights for me. Part of Martina's show, the Dixie Chicks & the first half of Zac Brown. But too much pop from Dierks & rock adventurism from ZBB.....My feel overall about todays' do was the overall idea seemed to be, let's do a Country Music Festival where the music doesn't sound country! A bit unfair, maybe. Martina was certainly country &, for the most part, so were the Dixie Chicks. 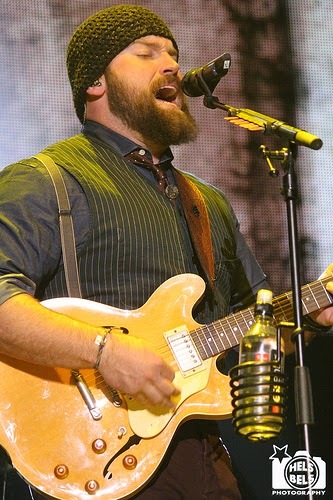 The Zac Brown Band were for the first 40 minutes, but then something weird happened! And Dierks Bentley- I know he can do proper country, because I heard him & was impressed with him on Bob Harris Thursday night. But tonight- nah! ....It was all this Bro' Country type of stuff & grandstanding for the audience. I had started to look forward to his segment after hearing him on Bob Harris Thursday night. Not much country, I headed out of the arena after about 25 mins, returned for the last ten minutes or so. After a brilliant start with the CMA Songwriters thingy Friday night, I found today overall a disappoint.... But people do drift in & out... the couple sitting next to me were there for Martina, left shortly after Dierks came on, were back for The Chicks & left shortly after the ZBB came on. On the other side of me, they only really responded to the Dixie Chicks & left early in the ZBB set. A lot of people probably only there for one or two acts. almost everyone else loved them. The star, as I had expected, was Brett James, who has one of the most emotive vocal instruments I've ever heard....Martina Mcbride opened with a powerful set. I've seen her many times and her voice was in FULL stride. 'Seriously good form. Dierks Bentley was also great. A solid, arena-quality performance. His voice is good, but not perhaps great. His songs are pretty good, but not stunning. He's one of those guys who isn't GREAT at any one part of the game, but is very good at everything....The Dixie Chicks were so-so. We found the sound very distorted on their set (not the case for MM and DB, so the problem was with the Chicks' sound mixer, I suppose). It was watchable, but not much more than that. Zac Brown were, and I am not exaggerating this one IOTA, the single worst set of music I've ever sat through.....and I've sat through thousands. The first half of the set was pretty bad, and it quickly got worse....much worse. Instead of GOOD Country music, what we got was BAD Heavy Metal. The capper was them, for reasons known best to themselves, coming back for their encore in halloween costumes. In any case, I would pay a LOT of money not to have to see them. If they ever grace these shores again I will be abroad that day!! :) The reality was that all four of us agreed that the order of the four stars was backwards.....the worst two (by a mile) came last and the best two opened.